• Mirova draws on the expertise of some forty specialists with complementary backgrounds: experts on thematic strategies, engineers, financial and ESG(1) analysts, and project finance and solidarity finance professionals. • These specialists work collaboratively and share the same ambition: to identify the drivers of sustainable economic development. 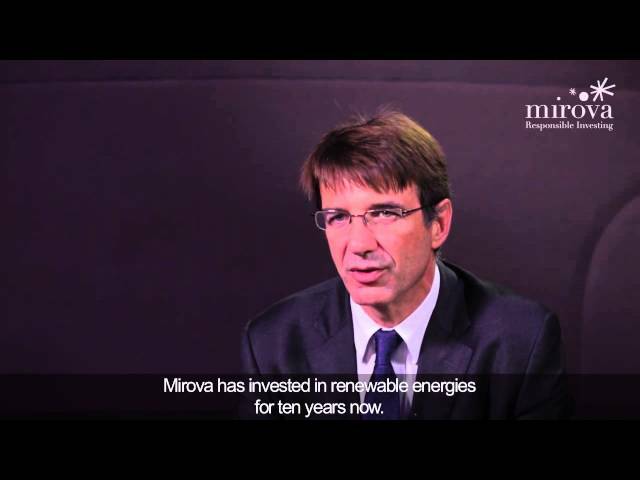 Through the creation of Mirova, a management company dedicated exclusively to socially responsible investing, Philippe has contributed to the emergence of sustainable financing both in France and the rest of Europe. He has also been involved with various professional associations, including the AFG (French Asset Management Association) and EFAMA (European Fund and Asset Management Association) and international initiatives such as the ICGN (International Corporate Governance Network), IIRC (International Integrated Reporting Council) and ILG (Investment Leaders Group). Philippe was recently appointed a member of the European Commission’s HLEG (High-Level Expert Group on Sustainable Finance) and chairs Finance for Tomorrow, an initiative launched within the framework of Paris Europlace, which seeks to promote and develop green and sustainable finance in France. Philippe is a graduate of the ENSAE (École nationale de la statistique et de l’administration économique) and is an accredited member of the French Institute of Actuaries. She began her career in 1999 as a Project Manager for a company aiming to help get people out of work for a long period back into employment in the catering industry, thereby reconciling social and economic performance. In 2000, Anne-Laurence joined the management consulting firm AT Kearney as a Business Analyst and then as a Senior Associate with financial institutions. In this role she worked on a wide array of strategic, development and restructuring projects for asset managers, insurers, private equity firms and merchant and investment banks. Anne-Laurence joined Natixis in 2005 before becoming Head of Strategic Planning at Natixis Asset Management in 2007. While in this post Anne-Laurence played a pivotal role in highlighting the importance of responsible financing. This strategic priority led to the creation of a business unit within Natixis Asset Management dedicated to responsible investment. This unit later developed into Mirova. Anne-Laurence Roucher is a graduate of the French business school ESCP (École supérieure de commerce de Paris). Jens began his career as a financial advisor at KBC Bank in Brussels in 1998, before moving to KBC Asset Management as a financial analyst in 2001. He became portfolio manager in 2003 and for the next 10 years, he was responsible for thematic environmental equities for the KBC group and KBI (Kleinwort Benson Investors, Dublin). He also became a specialist in water, agribusiness and cleantech (renewable energies, energy efficiency, waste management) strategies and is a frequent speaker at conferences. Jens joined Mirova in 2013. Jens holds a Master's degree in Applied Economics from the University of Antwerp in Belgium. He is also a CFA Charter Holder and obtained the CEFA (Certified European Financial Analyst) certification from the BVFA-ABAF (Belgian Association of Financial Analysts). Hervé Guez has 20 years of experience of buy and sell-side. Having been at Mirova since 2008, Hervé is Global Head of Research and CIO of Equities & Fixed Income since 2017. He serves on the board of the French Sustainable Investment Forum (SIF), and represents Mirova with many professional organizations, including UNEP-FI, the PRI, Eurosif and the French SIF. Mirova publishes regular in-depth research, both independently and in partnership with the University of Cambridge. Passionate about responsible investment, Hervé Guez co-authored “Positive Finance: A Toolkit for Responsible Transformation” with Philippe Zaouati, Mirova CEO, in 2014. Hervé holds a Masters in Banking & Finance and the Certified International Investment Analyst Diploma, issued by the French Society of Financial Analysts (SFAF). Raphael began his career in project finance at Crédit Lyonnais, first in Vietnam then in France. In 1997 he joined General Electric, with whom he spent 12 years, holding various managerial positions in Finance and M&A at GE Healthcare, GE Oil & Gas and GE Energy Financial Services in various European countries. He joined Mirova in 2009 to manage the renewable energy infrastructure fund. Raphael holds a number of postgraduate qualifications, including a Masters in Finance from Paris Dauphine University and the International Executive Program at INSEAD. Gwenola leads Mirova’s general infrastructure platform and is responsible for managing its investment and capital raising activities. Throughout her 22 year career, Gwenola has developed an extensive knowledge of European infrastructure and has deep experience of financing and investing in infrastructure assets. She has worked on a number of landmark transactions, including the first PPP projects in Belgium and the Netherlands, and in 2016 raised continental Europe’s first brownfield continuation fund. Before joining Mirova, Gwenola was Head of European infrastructure at CFIG, and prior to that was a senior member of the project finance team at BNP Paribas. Gwenola is a member of a number of groups including the European Commission’s Experts in Infrastructure working group, the PRI expert group, the GRESB working group, EFAMA, and the AFG and AFIC working groups for infrastructure. Gwenola is an active member of the IFA (French Management Institute) and teaches Masters’ level courses in project finance at the ESSEC business school. Gwenola holds a Master in Business from the ESCP business school.